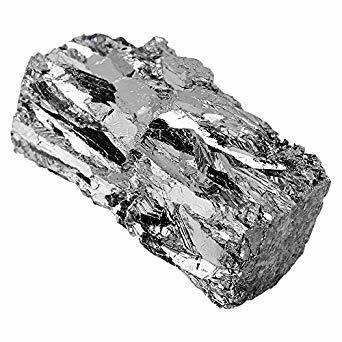 Our Pewter Ingots are approximately 2 pounds each and are made up of 92% Tin, 7.5% Antimony, and 0.5% Copper. This is lead-free pewter and is very good to use for casting. We sell this Pewter in ingot form as shown in the product images. This type of Pewter is also known as Britannia Alloy. Be sure to see our promotional discounts for certain quantity levels if you would like to save money. This item is one of our best sellers because of its versatility and ease of use. MADE IN THE USA. USAGE - This is lead-free pewter and is very good to use for casting. It melts easily and retains its shine. This pewter is used often in jewelry making and also making utensils, teapots, candlesticks, urns, maces, and drinking vessels. This item is one of our best sellers because of its versatility and ease of use. 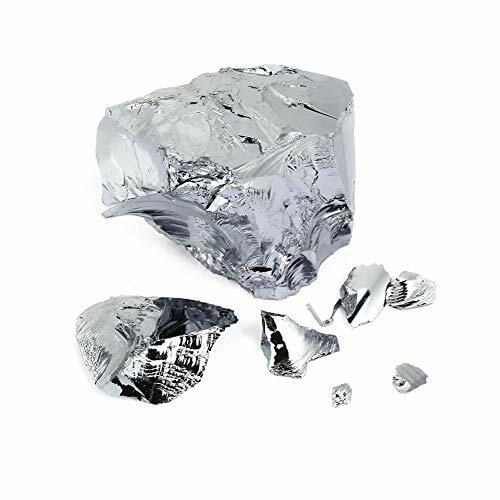 SPECIFICATIONS - Melting Point (F) = 563 | Pouring Temp (F) = 650 | Density (g/cm3) = 7.28 | Analysis: TIN 91.9708%, ANTIMONY 7.4992%, COPPER 0.5001%. PACKAGING - This 2lb pewter ingot will arrive sealed inside of heavy duty BPA free plastic to prevent any corrosion or oxidation. Each 2lb ingot is guaranteed to be 2lbs plus or minus 4%. 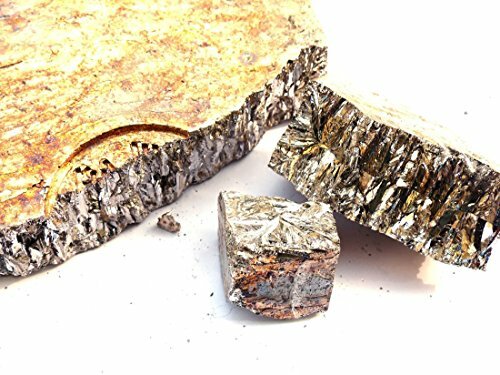 PEWTER INGOT 2LBS - BRITANNIA ALLOY - 92% TIN | 7.5% ANTIMONY | 0.5% COPPER. 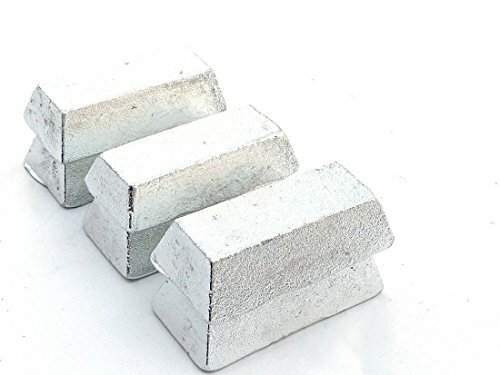 Our Pewter Ingots are approximately 2 pounds each and are made up of 92% Tin, 7.5% Antimony, and 0.5% Copper. This is lead-free pewter and is very good to use for casting. We sell this Pewter in ingot form as shown in the product images. This type of Pewter is also known as Britannia Alloy. Be sure to see our promotional discounts for certain quantity levels if you would like to save money. MADE IN THE USA. Our Pewter Bars are approximately 1 pound each and are made up of 92% Tin, 7.5% Antimony, and 0.5% Copper. This is lead-free pewter and is very good to use for casting. We sell this Pewter in bar form as shown in the product images. This type of Pewter is also known as Britannia Alloy. 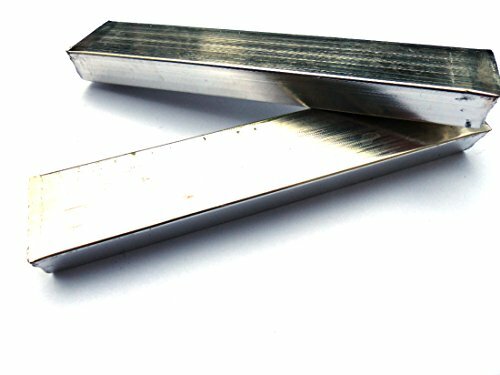 Pewter Bars (1 Pound - Britannia Alloy - Lead Free) - 92% TIN | 7.5% ANTIMONY | 0.5% COPPER. Our Pewter bars are approximately 1lb each and are made up of 92% Tin, 7.5% Antimony, and 0.5% Copper. This is lead-free pewter and is very good to use for casting. We sell this Pewter in bar form as shown in the product images. This type of Pewter is also known as Britannia Alloy. Be sure to see our promotional discounts for certain quantity levels if you would like to save money. 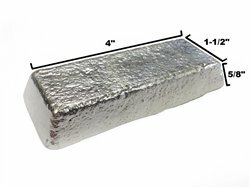 SIZE - Each 1lb pewter bar is approximately 6 inches long by .75 inches wide by .50 inches high. May be cut into 2 pieces for shipping. PACKAGING - This 1lb pewter bar will arrive sealed in heavy duty BPA free plastic to prevent any corrosion or oxidation. Each 1lb pewter bar is guaranteed to be 1lb plus or minus 4%. You will receive a box containing 8 pounds of bismuth chunks. It will arrive in multiple pieces. Bismuth metal is great for element collectors, crystal makers or any one who has a use for a low melting temperature metal. 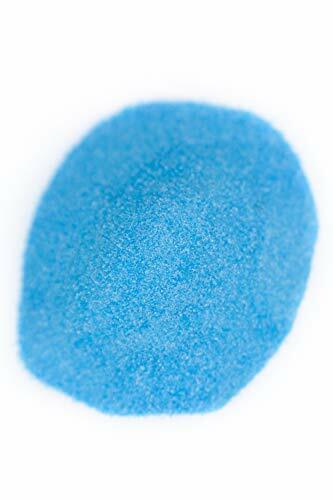 It is a non toxic metal with symbol Bi and atomic number 83 Element 83 has quite the repertoire of unique features: Low melting temperature making it perfect for DIY casting projects and alloying. With some practice, you can make beautiful hopper crystals. The most diamagnetic element (repels magnetic fields). Has one of the lowest thermal conductivity values among metals. Expands upon solidification like ice from water, and can be used to make a tight-fiting casting such as typesetting. Makes an excellent lead substitute due to being non toxic, although you should still wear protection when handling it. In earth's crust, it is twice as rare as palladium and only twice as abundant as platinum and gold. 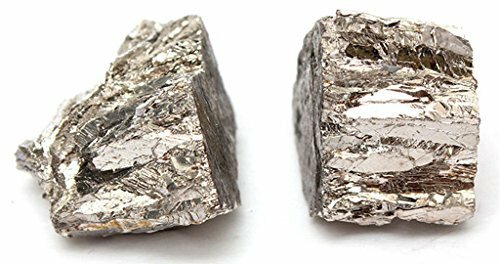 Increased phase-out of lead in manufacturing means demand for Bismuth (and its price) will skyrocket - it's only a matter of time. Bi is very brittle so expect some crumbling during shipping. We always strive to provide the biggest chunks possible. HIGH QUALITY: 100% brand new and high quality. 99.99% high purity monocrystalline silicon block. GOOD FEATURE: Monocrystalline silicon has a diamond lattice, the crystal is hard and brittle, has a metallic luster, can conduct electricity, but has a conductivity lower than that of metal, and increases with temperature, and has semiconductor properties. ENERGY CONVERSING: It can also be used to make solar cell, conversing solar to electricity. USAGE: It is the raw material for manufacturing semiconductor silicon devices, used to manufacture high power rectifiers, high power transistors, diodes, switching devices, etc. You will receive .9 - 1.1 pounds of 99.99% pure bismuth chunks. It will arrive in multiple pieces. Bismuth metal is great for element collectors, crystal makers or any one who has a use for a low melting temperature metal. It is a non toxic metal with symbol Bi and atomic number 83 Element 83 has quite the repertoire of unique features: Low melting temperature making it perfect for DIY casting projects and alloying. With some practice, you can make beautiful hopper crystals. The most diamagnetic element (repels magnetic fields). Has one of the lowest thermal conductivity values among metals. Expands upon solidification like ice from water, and can be used to make a tight-fiting casting such as typesetting. Makes an excellent lead substitute due to being non toxic, although you should still wear protection when handling it. In earth's crust, it is twice as rare as palladium and only twice as abundant as platinum and gold. Increased phase-out of lead in manufacturing means demand for Bismuth (and its price) will skyrocket - it's only a matter of time. Bi is very brittle so expect some crumbling during shipping. We always strive to provide the biggest chunks possible. 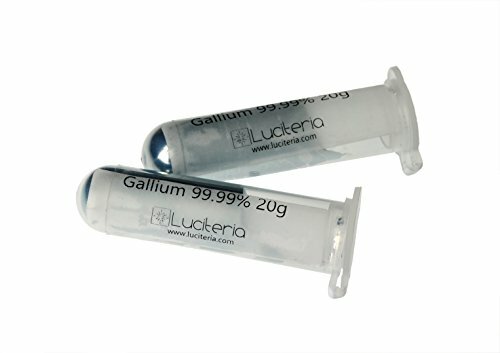 40 grams of 99.99% pure gallium metal from Luciteria Science. 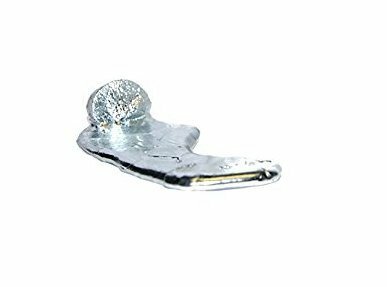 Gallium melts at just 86 degrees Fahrenheit which means it can melt in your hand or when the weather gets hot. Gallium is nontoxic. If you accidentally get it on the carpet it can be easily washed out with soap and water. 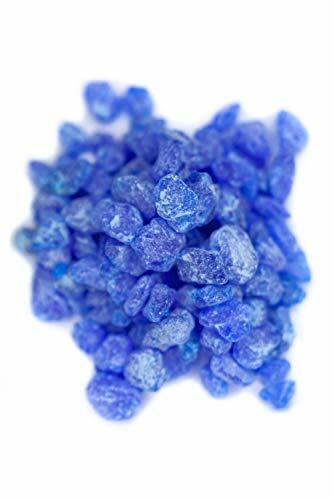 This is a 50 Pound bag of Fine Powder Copper Sulfate Crystals. (Powder) It is also EPA labeled for algae and root control. Shipped by FedEx ground in a box. You will receive a kilogram of 99.99% pure bismuth chunks. It will arrive in multiple pieces. Bismuth metal is great for element collectors, crystal makers or any one who has a use for a low melting temperature metal. It is a non toxic metal with symbol Bi and atomic number 83 Element 83 has quite the repertoire of unique features: Low melting temperature making it perfect for DIY casting projects and alloying. With some practice, you can make beautiful hopper crystals. The most diamagnetic element (repels magnetic fields). Has one of the lowest thermal conductivity values among metals. Expands upon solidification like ice from water, and can be used to make a tight-fiting casting such as typesetting. Makes an excellent lead substitute due to being non toxic, although you should still wear protection when handling it. In earth's crust, it is twice as rare as palladium and only twice as abundant as platinum and gold. 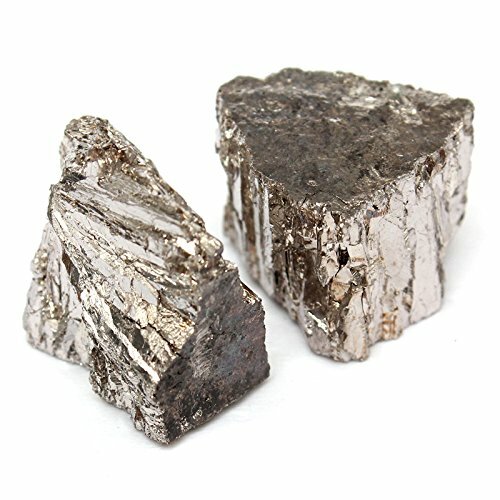 Increased phase-out of lead in manufacturing means demand for Bismuth (and its price) will skyrocket - it's only a matter of time. Bi is very brittle so expect some crumbling during shipping. We always strive to provide the biggest chunks possible. AC - Casting Alloy (Pewter) An excellent casting pewter that contains approximately 92% Tin, 7.75% Antimony and .25% Copper. The copper makes the metal more ductile so that it can be formed easier with a hammer if necessary. This is consistent with old fashion English pewter (Britannia 8) International standard for lead free pewter. Melting temperature is 462-474 F. Each ingot weighs about 1 pound and measures approximately 3/4" x 1-1/2" x 4". Our lead-free pewters are used for the finest jewelry, gifts, collectibles, novelty items, accessories, awards, and decorations. These alloys can also be used to cast into plaster of paris, sand, and rubber molds. Bismuth Chunk (5 pounds | 99.99+% Pure) Our Bismuth Chunk is sourced directly from the Chenzhou Bismuth Group where it is produced and is 100% virgin metal (not recycled). We sell this metal by the 5lb pound increment, so if you need 10lbs, simply add a quantity of 2 to your cart. Be sure to see our promotional discounts for certain quantity levels if you would like to save money per pound. USAGE - This is high purity bismuth that can be confidently used in any application where bismuth is required. This item is one of our best sellers because of its versatility and ease of use. This is the best choice for making crystals with pure bismuth. SIZE - Each piece of bismuth chunk or ingot approximately 2 inches to 4 inches in length and width. Each piece varies in exact size and shape - The bismuth chunk is generally irregular in shape. SPECIFICATIONS - Atomic Number = 50 | Melting Point (F) = 450 | Atomic Mass= 118.71 | Boiling Point (F) = 4100 | Density (g/cm3) = 7.29 | Analysis: BISMUTH 99.9982%. PACKAGING - The 5lbs of bismuth chunk will arrive sealed inside of heavy duty BPA free plastic to prevent any corrosion or oxidation.